I made several modifications to the pattern, some more succcessful than others. I replaced the folded hem with a 2 x 2 rib which I think looks better. The collar is less successful, I winged it with a straight folded collar which in retrospect would have benefited from some decrease rows. But, overall its not too bad and meets the requirement (keeping warm in the office). Knitted in Cascade 220 on my lovely lantern moon 5mm needles. The red is 220 Paints in colour 9926 and the sleeves and collar are 220 Heather in 9449, I used 4 skeins of the red and 3 of the blue. Navy separating zipper came from Hancocks. Not that it feels much like a holiday season yet...no matter how much tinsel and baubles you display, 80 degree temperatures and sunshine do not feel like Christmas. 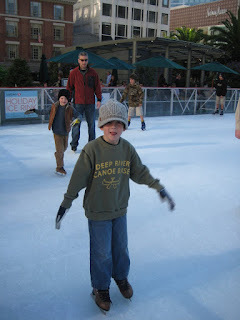 This weekend we took the boys up to the new ice rink in Union Square. 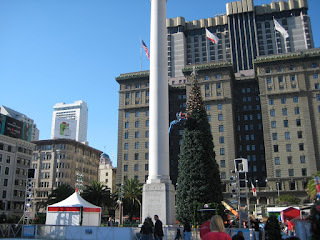 I heard that they had put up the tree - but as you can see, they were still decorating it when we arrived. 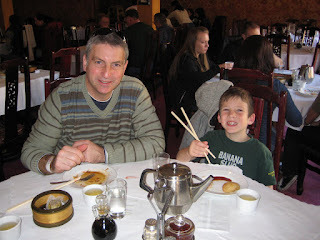 Afterwards we headed into Chinatown for some Dim Sum. 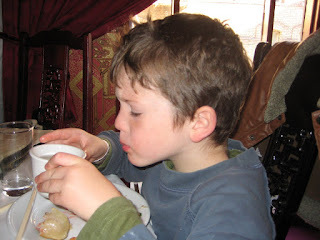 The boys still struggle with chopsticks, and the restaurants only provide forks as an accomodation - no knives - but they tried everything and love the jasmine tea. I think you all know the lyric. The boys' school hosted a vistiting artist a few weeks ago. Travis Meinolf is a young and hip weaver who brought his portable rigid heddle loom into the school. 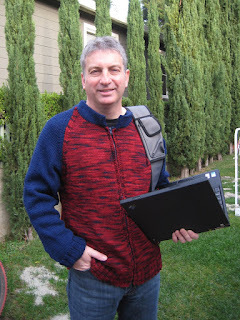 His home page actually shows a photo that was taken at the school and you can see him at the start of the project: the children brought in items to be woven into a hanging. The finished result included all sorts of materials, I saw leaves, wire, a serial cable, a slinky, phone cord and so on. 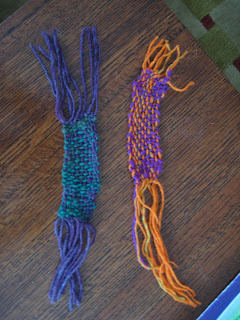 He was packing up his loom as I was collecting Finlay from school and Finlay insisted that I go and look at the weaving that the school had created. Both my boys were pretty excited by the project and we talked to Travis for a little while. He told us about the instructions on his website for making a loom out of cardboard and gave us a card loom that he has developed for use in schools. We used both his card loom, and made our own out of card. This rather blurry photo shows the weaving process. 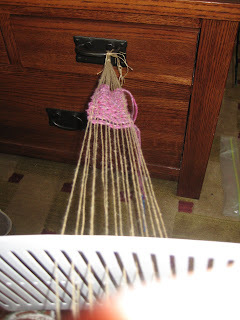 We tied one end of the warp to the coffee table, and the other to a pencil. 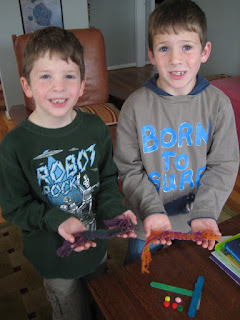 I held the ends firm while the boys used an elastic bodkin as a shuttle. They were really pleased with thier bookmarks, especially as they achieved pretty good results in a short time. I'm a little late in updating, but the final day out of our long weekend was to Castle Rock State Park. Adam and Nigel had visited previously on their backpacking trip, but it was the first time I had been there. 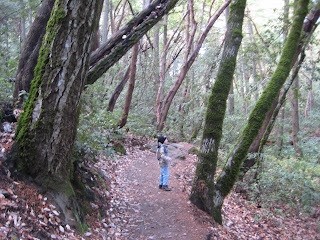 It was an interesting mix of shady and wooded areas, with large boulders and trees covered in moss, and in the sunshine steep hills covered with manzanita. We walked for about 1 hour 45 minutes, we got as far as the Goat Rock formation before turning back. We were rewarded by some great views across the coastal range hills. 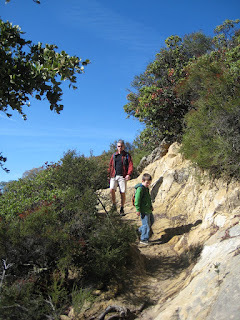 The trails were quite steep and required some scrambling, of course this added to the appeal for the boys. 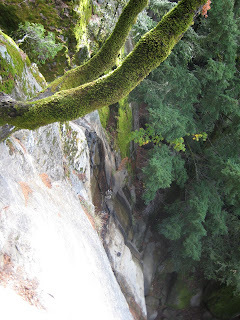 There was only a little water in the Castle Rock falls (below) but we stopped for a while to listen to the water. Several groups of climbers arrived while we waited there to discuss a decent. On their last visit Adam was thrilled to watch climbers ascend this cliff. We had a nice walk, and picnic, and made plans to come back to this park again, although I have not yet been convinced to hike to the campground there! It's so close to home, and a nice alternative to the redwood forests. The boys especially loved climbing on the big rocks. After heavy rain Saturday night, Sunday looked to be a bright day, so we thought we would do a bike ride locally. We cycled into Campbell where there is a farmer's market on Sundays. (Somewhat like our own Farmer's market really) and where we ran into Lynne and Nathan. It was a lovely clear day, not too hot and we stopped and had brunch before we come home. 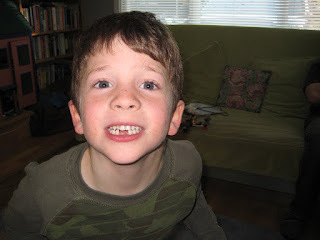 Finlay was particularly pleased to make it all the way there and back. 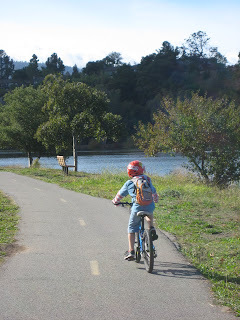 It's a 7 mile round-trip from our house and the longest ride he has done on his own bike. This is Adam - an action shot from my own bike (at considerable risk to life and limb!). The boys have a few days off school making this a long weekend. 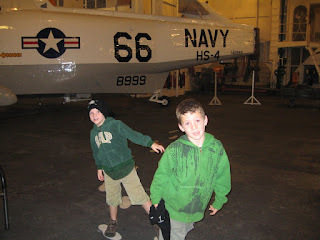 We thought we would re-visit the USS Hornet. We last went there on my Father's 60th birthday (boy - does he know how to celebrate!!). Anyway, it was a good place to visit with the boys. They were especially interested in the role the Hornet played in the Apollo missions. Here they are walking in the footprints of Armstrong, Aldrin, and Collins. 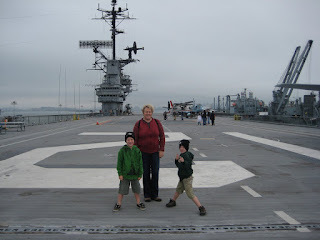 We managed a tour of the flight deck, the hangar deck and some of the lower deck. There is a lot more restored since we last visited, but the best part is still the docents, who are largely veterans, many having served on the Hornet itself. They have the stories that really make a visit come to life. After the Hornet we headed off the Naval base and towards Washington Park. 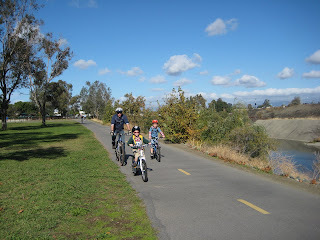 We got on our bikes and headed off along Shoreline drive. There is a bike trail all along the beach. 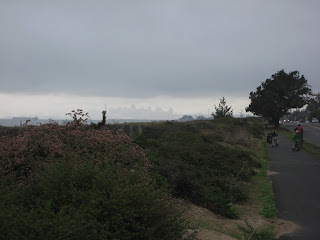 There was a slight drizzle during the ride - but in this photo you can see Nigel and the boys on the bike trail, and in the distance, wreathed in mist, San Francisco. We had not really seen anything of Alameda previously, apart from the Hornet, and it looked really nice. It was great to be able to ride alongside the beach and the whole area had a real vacation feel to it, rather like Bournemouth we thought! I've a new project on the needles. This is for Nigel who requested a jacket similar to my Ribby Cardi . Since it got cold here I've had quite a lot of wear from it. The pattern is Retrofit from Knitty.com. Im going to knit the body in this red: Cascade 220 paints in colour 9926, and the sleeves and collar in Cascade 220 in grey (8400) which is left-over from my Loppem cardigan. This colour is apparently very hard to photograph as it's really not pink or purple at all - but a deep red. I've already modified the pattern and am knitting a 2 x 2 rib in the body colour rather than a contrast folded hem. 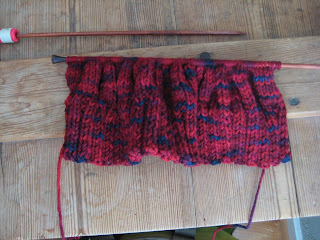 I've knitted more since I took this photo and am at the underarm decreases already. Hopefuly it will be a quick knit and he can have it before ski season, as requested. It's finished! Off the needles: Lizard Ridge. I decided to stick at 24 squares and keep the blanket for use as a throw - or maybe in Adam's room when it gets cold. I knitted an i-cord edge in Mission Falls Dk weight wool in a dark olive green. The boys were sitting under half of the blanket watching Star Wars on Saturday while I finished the edge. 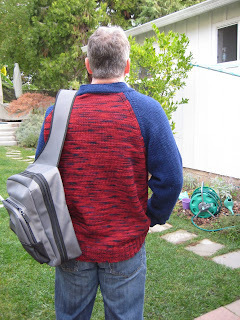 I really enjoyed knitting this - and it was much quicker than I expected. The squares mostly could be finished in a couple of hours of knitting. It took me 3 evenings to seam it and about the same to knit the i-cord edge. I decided to sew the squares alternating the direction of the pattern, ie sewed each 'strip' with the same direction, but alternated the direction of the pattern when sewing the strips together. 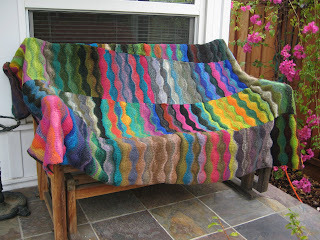 This gave a more patchwork look rather than the wavy pattern continuing across the blanket. I managed to get most of the Kureyon with some discount or other. I used 22 balls, two of the squares were patched together from left-overs. I had plenty of wool left over and could have made up more squares - but my colour combinations just were not as nice as the Noro ones so I decided it was worth buying the additional balls...Im sure I''ll find a use for Kureyon scraps sooner or later. Well, these pictures are from Halloween - but the title might well refer to the results of today's election. 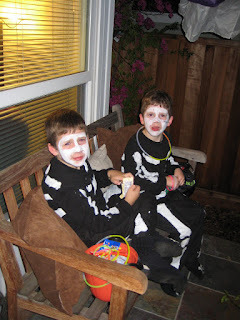 The boys wore the skeleton costumes they made last year. 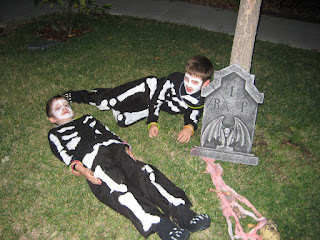 This year they are posing in our garden...we got some new Halloween decorations because the boys complained that all our decorations were smiling and not scary. Here they are with their swag...before the usual candy-for-lego exchange! I finished Loppem this week and wore it today to the school Halloween party. (Hence the too-small orange top). On the whole I am pretty pleased with it. 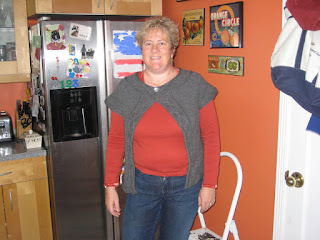 The yoke/front does not seem to sit quite right in these pictures, but I think it's mostly to do with how I'm standing. I'm also sure it would look better with a different top underneath, maybe a roll-neck. However, the weight is perfect for a Californian winter...where it never really gets cold enough for 'heavy duty' knitwear. I obtained a 2nd edition of the Norah Gaughan Vol 3 book, without the errors that apparently plague the 1st edition. I found the pattern easy enough and quick to knit. I used Cascade 220 from my stash, just over 3 skeins I think. The buttons are pewter globe buttons from Green Planet Yarns in Cambell. 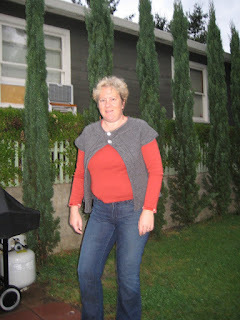 I didn't make any modifications to the pattern, although I did knit it 4" longer than specified from hem to sleeves. I have 6.5 repeats of the cable pattern. If I were knitting this again I might also make the purl rows on the hem into a larger hem of garter stitch. 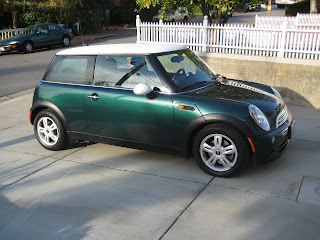 The back of the top rolled like mad and I had to steam the living daylights out of it to get it to lay flat. The sleeves didnt seem to have the same problem.